One You Merton is supporting Men’s Health Week 2017 which runs from Monday 12th to Sunday 18th June. The theme for this year’s campaign focuses on belly fat. This is because this type of fat is bad for your health and men are more likely to have it than women. Why is waist size so important? In order to get an accurate measure for your waist don’t follow your trouser size! – You need to measure your stomach at the belly button. 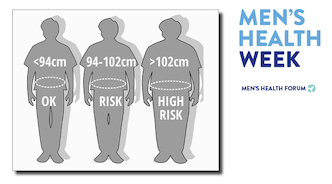 If your waist measures over 37 inches (94cm), you are at increased risk of diabetes, heart disease, cancer, stroke and erection problems. If it’s over 40 inches (102cm), you’re at a considerably increased risk of all the conditions mentioned above. Your Body Mass Index (BMI) is a way of finding out if you are at a healthy weight for your age and gender and is worked out through measuring your height and weight. You can find out your BMI by using the BMI calculator on the NHS Choices website here. There are many things you can do to lose weight including changing your diet, being more active and drinking less alcohol. One You have a number of apps that might be helpful in changing your lifestyle. These include the Easy Meals, Couch to 5K, Active 10 Walking Tracker, Days Off and Drinks Tracker apps which are all available here. If you would prefer to talk to someone about making some lifestyle changes then call the One You Merton health advisors on 020 8973 3545. You can get more information about Men’s Health Week by visiting the website here.